Ever wished you could sit one on one with a family counselor and receive the same tools we share with families trying to improve their structure and connection with their children? Michelle Nietert, is a licensed professional counselor and the clinical director of a large metroplex counseling center. She is offering her summer subscribers a chance to receive the same materials she shares with her clients and free downloads. Have you like me promised yourself over and over this summer will be different? I will do something meaningful with my kids this summer. I will have them do chores and create some kind of structure. By July they are staying up late, sleeping in and chaos abounds. You feel like you are in survival mode and by August you are exhausted and wishing things had been different. Join me this summer as I attempt for me what seems like the impossible. As a professional counselor of over 20 years, I know the best way to create change is with support so I’m putting it out there. Will you join other moms across the country working together and encouraging one another? I’ll provide resources, encouragement and a place for accountability. I’m simply asking you to sign up for this experiment and then share the opportunity with your friends. 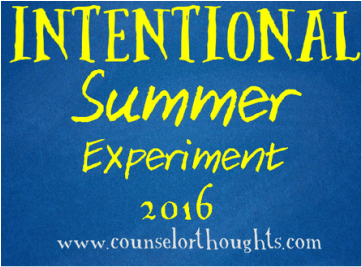 Today when you sign up, you’ll receive updates to Intentional Summer Experiment. You can look forward to posts with information including my basic summer schedule (when we are at home), a reading list of resources I’m using, and a link to a free chore app for the google play or app stores my kids (imperfectly) use well. You will also be able to ask questions and share as we begin this journey together. Michelle also writes a CounselorThoughts blog sharing education and resources regarding real life challenges that parents need to be proactively addressing with their children such as grief, depression, anxiety, sleep problems, sexuality and gender issues, body image discussions and self harm. She empowers parents with thought provoking scripts and helpful resources.